CNA is the fastest growing career in the healthcare world wherein one can earn several benefits along with remuneration. According to a recent survey performed by indeed.com, it can be concluded that in January 2015, the average salary of a certified nursing assistant in Nebraska was $18,000, which was 27% lower as compared to the average salaries in other U.S. states. The average annual and hourly salary, as stated by the US Bureau of Labor Statistics, in May 2013 was $24,730 and $11.89, respectively. In the same year, 13,350 nurse aides were employed in the state, and the employment per 1000 jobs was approximately 14.40. The figures in the table below show the percentile income for Registered Nurses. 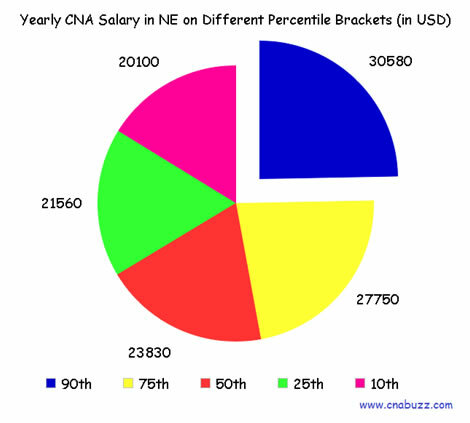 The annual wages of a CNA change at different percentile levels. 90% of CNAs were offered less than $30,580; 10% were paid more than $30,580. 75% of certified nurse assistants received less than $27,750; remaining 25% earned more than $27,750. 50% of the employees were waged less than $23,830; rest 50% salaried more than $23,830. 25% were paid annual wages less than $21,560; 75% were paid more than $21,560. 10% of employees earned less than $20,100; 90% made more than $20,100. Working location of a CNA majorly affect their salary. After analyzing the below table, you can conclude that Bellevue and Omaha were the highest paying cities in the state having median annual salary of $29,066 and median monthly salary of $2,422. North Platte offered the lowest annual ($21,619) and monthly salary ($1,802). The median weekly income in the state ranged from $416 to $559 while the median hourly income is from $10 to $14. In the field of healthcare, nurses are remunerated according to their job title. 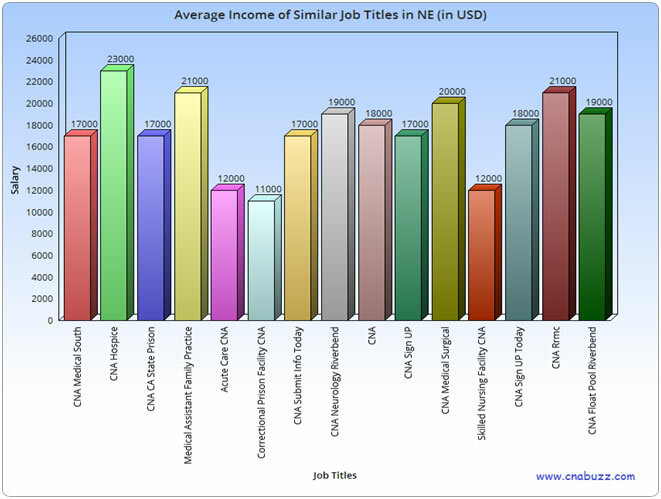 Since, CNA Hospice is the topmost position, they receive the highest salary i.e. $23,000. On the contrary, Correctional Prison Facility CNA gets the lowest salary ($11,000). The pay of other job holders ranges between $12,000 to $21,000. The job requirements of nursing assistants will rise by 21 percent between these years 2012-2022. But the only reason that may constraint this job growth is the dependence of nursing homes on government funding. Since the career opportunities are limited in this profession, nursing assistants generally leave their jobs and opt for higher formal program. Question 1 – Presently, I am working as a CNA in Lincoln, and planning to move to Bellevue. What annual salary can I expect in the city? Answer – The annual salary in Bellevue is $29,066, which is comparatively higher than the CNAs receive in Lincoln. Question 2 – I’ll be completing my certification in a few months, suggest me some top paying job titles that can offer me good salary package. Answer – CNA Hospice ($23,000), Medical Assistant Family Practice ($21,000), CNA Medical Surgical ($20,000), CNA Rrmc ($21,000) are some of the top paying job titles in Nebraska.